Penguin (PEN-gwin or PENG-gwin) is the common name for any of the aquatic, gregarious, flightless birds comprising the family Spheniscidae, living almost exclusively in the Southern Hemisphere, and characterized by a stout body, wings in the form of flippers, webbed feet on short legs that are placed far posterior on the body, and countershaded dark and white plumage. While highly adapted for life in the water, being excellent swimmers and divers, penguins also spend time on land, where they breed. There are about 17 extant species of penguins, placed in six genera in the subfamily Spheniscinae. All penguin species are native to the Southern Hemisphere, principally in cool regions, and a number breed in Antarctica and Sub-Antarctic islands. However, there also are several species that are found in the temperate zone, and one species, the Galápagos penguin, lives near the equator. Penguins are found off the coasts of South America, Africa, Australia, and New Zealand. There are no penguins based at the North Pole, as sometimes depicted in popular media; the only wild penguins in the northern hemisphere is the small group on the northernmost of the Galápagos. Penguins provide important ecological functions are part of food chains. Most penguins feed on krill, fish, cuttlefish, squid, and other forms of sealife caught while swimming underwater. Key predators include the leopard seal, killer whale, shark, rat, and stoat. For humans, the unique forms and behaviors of penguins have made them popular around the world. Their unusually upright, waddling gait adds to their appeal, and their striking black-and-white plumage is often likened to a tuxedo suit. Their monogamous pairing for breeding and the sacrificial parental care shown—such as the emperor penguin's walking a long distance on ice to the breeding site, undergoing substantial fasting (about 115 days for the male), and incubating the egg on their feet—adds a sympathetic quality to the birds and have led to their common depictions in various media (books, films, cartoons, television shows). Historically, penguins have been hunted for the oil from their substantial, insulating fat layer. Aiding this has been their large breeding aggregations and the fact many penguins seem to have no special fear of humans and have approached groups of explorers without hesitation. 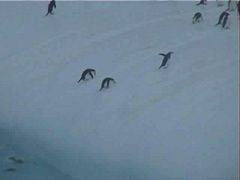 This is likely a function of their being no large land predators in Antarctica or the nearby offshore islands that prey on or attack penguins. Today, commercial fishing, destruction of breeding habitat, collection of eggs, and predation by introduced mammals, among other anthropogenic factors have posed major threats to wild populations, of which 12 appear on the IUCN Red List of Threatened Species. Penguins have stout bodies, with a characteristic upright posture and wings that are stiff, modified into flippers, and not folded against the body. The legs are short, placed far posterior on the body, and with webbed feet that have four forward pointing toes. Their bills are long, with impervious nares, and often laterally compressed. The feathers are small. They have 15 cervical vertebrae (Howard 2003). The largest living species is the emperor penguin (Aptenodytes forsteri): adults average about 1.1 meters (3 feet 7 inches) tall and weigh 35 kilograms (75 pounds) or more. The smallest penguin species is the little blue penguin (also known as the fairy penguin), which stands around 40 centimeters tall (16 inches) and weighs 1 kilogram (2.2 pounds). Among extant penguins larger penguins inhabit colder regions, while smaller penguins are generally found in temperate or even tropical climates (see also Bergmann's Rule). Some prehistoric species attained enormous sizes, becoming as tall or as heavy as an adult human (see below for more). These were not restricted to Antarctic regions; on the contrary, Sub-Antarctic regions harbored high diversity, and at least one giant penguin occurred in a region not quite 2,000 kilometers south of the Equator 35 million years ago, in a climate decidedly warmer than today. All penguins are countershaded for camouflage—that is, they have a white underside and a dark (mostly black) upperside. A predator looking up from below (such as an orca or a leopard seal) has difficulty distinguishing between a white penguin belly and the reflective water surface. The dark plumage on their backs camouflages them from aquatic predators from above. The penguin is an accomplished swimmer, having flippers instead of wings. Penguins are superbly adapted to an aquatic life. Their wings, in the form of flippers, are useless for flight in the air but allow penguins in water to be astonishingly agile. Within the smooth plumage, a layer of air is preserved, ensuring buoyancy. The air layer also helps insulate the birds in cold waters. Penguins can drink salt water because their supraorbital gland filters excess salt from the bloodstream (Saint Louis Zoo; van der Merwe). The salt is excreted in a concentrated fluid from the nasal passages. Their eyes are adapted for underwater vision, and are their primary means of locating prey and avoiding predators. They are sensitive to the various colors of the sea (violets, blues, greens) and have a second transparent eyelid that acts like goggles underwater (Saint Louis Zoo). In air it has been suggested that they are nearsighted, although research has not supported this hypothesis (Sivak et al. 1987). Penguins have a thick layer of insulating feathers that serve to keep them warm in water (heat loss in water is much greater than in air). The Emperor penguin, endemic to Antarctica, has the largest body mass of all penguins, which further reduces relative surface area and heat loss. They also are able to control blood flow to their extremities, reducing the amount of blood that gets cold, but still keeping the extremities from freezing. In the extreme cold of the Antarctic winter, the females are at sea fishing for food, leaving the males to brave the weather by themselves. They often huddle together to keep warm and rotate positions to make sure that each penguin gets a turn in the center of the heat pack. Diving penguins reach 6 to 12 kilometers per hour (3.7-7.5 mph), though there are reports of velocities of 27 kilometers per hour (17 mph) (which are more realistic in the case of startled flight). The small penguins do not usually dive deep; they catch their prey near the surface in dives that normally last only one or two minutes. Larger penguins can dive deep in case of need. Dives of the large emperor penguin have been recorded that reach a depth of 565 meters (1,870 feet) and last up to 22 minutes. On land, penguins use their tails and wings to maintain balance for their upright stance. Penguins either waddle on their feet or slide on their bellies across the snow, a movement called "tobogganing," which conserves energy while allowing them to move quickly. They also jump with both feet together if they want to move more quickly or cross steep or rocky terrain. Penguins have an average sense of hearing for birds (Wever et al. 1969); this is used by parents and chicks to locate one another in crowded colonies (Jouventin et al. 1999). Penguins of the Antarctic and Sub-Antarctic breed on coasts and pack ice, while those closer to the equator tend to breed in coastal or forest habitats (Howard 2003). 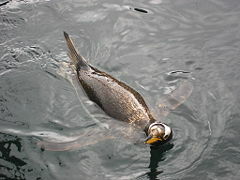 Most species breed in large colonies, with the Macaroni penguin colony in South Georgia estimated to attract five million pairs (Howard 2003). Penguins form monogamous pairs for a breeding season, though the rate the same pair recouples varies drastically according to species. Nests range from holes dug in soft soil, depressions in rocks, shallow dishes of vegetation and pebbles, to the space between the top of the feet and the abdominal skin (Howard 2003). Most penguins lay two eggs in a clutch, though the two largest species, the emperor and the king penguins, lay only one (Williams 1995). With the exception of the emperor penguin, all penguins share the incubation duties (Numata et al. 2000). These incubation shifts can last days and even weeks as one member of the pair feeds at sea. Penguin eggs are smaller than any other bird species when compared proportionally to the weight of the parent birds; at 52 grams, the little penguin egg is 4.7 percent of its mothers' weight, and the 450-gram emperor penguin egg is 2.3 percent (Williams 1995). The relatively thick shell forms between 10 and 16 percent of the weight of a penguin egg, presumably to minimize risk of breakage in an adverse nesting environment. The yolk, too, is large, and comprises 22 to 31 percent of the egg. Some yolk often remains when a chick is born, and is thought to help sustain it if parents are delayed in returning with food (Williams 1995). In those penguins that lay two eggs, often the younger of two chicks will not survive (Howard 2003). When mothers lose a chick, they sometimes attempt to "steal" another mother's chick, usually unsuccessfully as other females in the vicinity assist the defending mother in keeping her chick. In some species, such as emperor penguins, young penguins assemble in large groups called crèches. Extant penguins comprise the subfamily Spheniscinae in the family Spheniscidae. Spheniscidae traditionally was placed in the order Sphenisciformes, as the sole extant family. However, some taxonomists have enlarged the Ciconiiformes to include the Spheniscidae family, as in the Sibley-Ahlquist taxonomy (ITIS 2004). The radical and influential Sibley-Ahlquist taxonomy, based on Sibley and Ahlquist's landmark DNA-DNA hybridization studies, greatly enlarged the Ciconiiformes, adding many more families, including most of those usually regarded as belonging to the Sphenisciformes (penguins), Gaviiformes (divers), Podicipediformes (grebes), Procellariiformes (tubenosed seabirds), Charadriiformes, (waders, gulls, terns and auks), Pelecaniformes (pelicans, cormorants, gannets and allies), and the Falconiformes (diurnal birds of prey). However, many have rejected this taxonomy, and penguins commonly are listed as members of the order Sphenisciformes (Howard 2003). Some recent sources (Clarke et al. 2003; Ksepka et al. 2006) apply the phylogenetic taxon Spheniscidae to what here is referred to as Spheniscinae. Furthermore, they restrict the phylogenetic taxon Sphenisciformes to flightless taxa, and establish the phylogenetic taxon Pansphenisciformes as equivalent to the Linnean taxon Sphenisciformes (Clarke et al. 2003), in other words, including any flying basal "proto-penguins" to be discovered eventually. Given that neither the relationships of the penguin subfamilies to each other nor the placement of the penguins in the avian phylogeny is presently resolved, the established Linnean system is thus followed here. Emperor penguins (Aptenodytes forsteri), the largest living species. Adelie penguin (Pygoscelis adeliae) feeding young. Like its relatives, a neatly bi-coloured species with a head marking. Magellanic penguins (Spheniscus magellanicus) guarding nest burrow. The closed neck collar denotes this species. Closeup of Southern rockhopper penguin (Eudyptes chrysocome). The number of extant penguin species is debated. Depending on which authority is followed, penguin biodiversity varies between 17 and 20 living species, all in the subfamily Spheniscinae. Some sources consider the white-flippered penguin a separate Eudyptula species, while others treat it as a subspecies of the little penguin (Williams 1995; David and Renner 2003); the actual situation seems to be more complicated (Banks et al. 2002). Similarly, it is still unclear whether the royal penguin is merely a color morph of the Macaroni penguin. Also eligible to be a separate species is the Northern population of Rockhopper penguins (Davis and Renner 2003). Perudyptes (Middle Eocene of Atacama Desert, Peru)—basal? Delphinornis (Middle/Late Eocene? - Early Oligocene of Seymour Island, Antarctica) — Palaeeudyptinae, basal, new subfamily 1? A damaged tarsometatarsus of the prehistoric Narrow-flippered Penguin (Palaeeudyptes antarcticus). The evolutionary history of penguins is extensively researched and represents a showcase of evolutionary biogeography; though as penguin bones of any one species vary much in size and few good specimens are known, the alpha taxonomy of many prehistoric forms still leaves much to be desired. Some seminal articles about penguin prehistory have been published since 2005 (Bertelli and Giannini 2005; Baker et al. 2006; Ksepka et al. 2006; Slack et al. 2006). The basal penguins are considered to have lived around the time of the Cretaceous–Tertiary extinction event, somewhere in the general area of (southern) New Zealand and Byrd Land, Antarctica (Ksepka et al. 2006). Due to plate tectonics, these areas were at that time less than 1500 kilometers rather than the 4000 kilometers of today. The most recent common ancestor of penguins and their sister clade has been roughly dated to the Campanian–Maastrichtian boundary, around 70–68 million years ago (Baker et al. 2006; Slack et al. 2006). What can be said as certainly as possible in the absence of direct (that is, fossil) evidence is that by the end of the Cretaceous, the penguin lineage must have been evolutionarily well distinct, though much less so morphologically; it is fairly likely that they were not yet entirely flightless at that time, as flightless birds appear to have generally low resilience to the breakdown of trophic webs that follow the initial phase of mass extinctions because of their below-average dispersal capabilities. The oldest known fossil penguin species is Waimanu manneringi, which lived in the early Paleocene epoch of New Zealand, or about 62 mya (Slack et al. 2006). While they were not as well-adapted to aquatic life as modern penguins, Waimanu were generally loon-like birds but already flightless, with short wings adapted for deep diving. They swam on the surface using mainly their feet, but the wings were—as opposed to most other diving birds, living and extinct—already adapting to underwater locomotion. Perudyptes from northern Peru was dated to 42 mya. 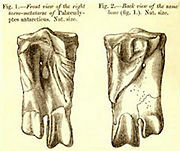 An unnamed fossil from Argentina indicates that by the Bartonian (Middle Eocene), some 39–38 mya (Baker et al. 2006), primitive penguins had spread to South America and were in the process of expanding into Atlantic waters (Clarke et al. 2003). During the Late Eocene and the Early Oligocene (40–30 mya), some lineages of gigantic penguins existed. Nordenskjoeld's giant penguin was the tallest, growing nearly 1.80 meters (6 feet) tall. The New Zealand giant penguin was probably the heaviest, weighing 80 kilograms or more. Both were found on New Zealand, the former also in the Antarctic farther eastwards. Traditionally, most extinct species of penguins, giant or small, had been placed in the paraphyletic subfamily called Palaeeudyptinae. More recently, with new taxa being discovered and placed in the phylogeny if possible, it is becoming accepted that there were at least two major extinct lineages. One or two closely related ones occurred in Patagonia, and at least one other—which is or includes the paleeudyptines as recognized today—occurred on most Antarctic and subantarctic coasts. 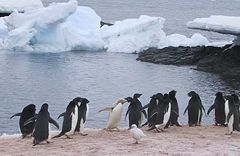 But size plasticity seems to have been great at this initial stage of penguin radiation: on Seymour Island, Antarctica, for example, around 10 known species of penguins ranging in size from medium to huge apparently coexisted some 35 mya during the Priabonian (Late Eocene) (Jadwiszczak 2006). It is not even known whether the gigantic palaeeudyptines constitute a monophyletic lineage, or whether gigantism was evolved independently in a much restricted Palaeeudyptinae and the Anthropornithinae—whether they were considered valid, or whether there was a wide size range present in the Palaeeudyptinae as delimited as usually done these days (that is, including Anthropornis nordenskjoeldi) (Ksepka et al. 2006). The oldest well-described giant penguin, the 5-foot-tall Icadyptes salasi, actually occurred as far north as northern Peru about 36 mya. In any case, the gigantic penguins had disappeared by the end of the Paleogene, around 25 mya. Their decline and disappearance coincided with the spread of the Squalodontoidea and other primitive, fish-eating toothed whales, which certainly competed with them for food, and were ultimately more successful (Baker et al. 2006). A new lineage, the Paraptenodytes, which includes smaller but decidedly stout-legged forms, had already arisen in southernmost South America by that time. The early Neogene saw the emergence of yet another morphotype in the same area, the similarly-sized but more gracile Palaeospheniscinae, as well as the radiation which gave rise to the penguin biodiversity of our time. Modern penguins consititute two undisputed clades and another two more basal genera with more ambiguous relationships (Bertelli and Giannini 2005). The origin of the Spheniscinae lies probably in the latest Paleogene, and geographically it must have been much the same as the general area in which the order evolved: The oceans between the Australia-New Zealand region and the Antarctic (Baker et al. 2006). Presumedly diverging from other penguins around 40 mya (Baker et al. 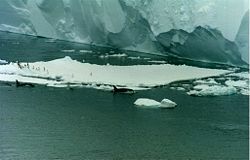 2006), it seems that the Spheniscinae were for quite some time limited to their ancestral area, as the well-researched deposits of the Antarctic Peninsula and Patagonia have not yielded Paleogene fossils of the subfamily. Also, the earliest spheniscine lineages are those with the most southern distribution. The genus Aptenodytes appears to be the basalmost divergence among living penguins; they have bright yellow-orange neck, breast, and bill patches; incubate by placing their eggs on their feet, and when they hatch the chicks are almost naked. This genus has a distribution centered on the Antarctic coasts and barely extends to some subantarctic islands today. 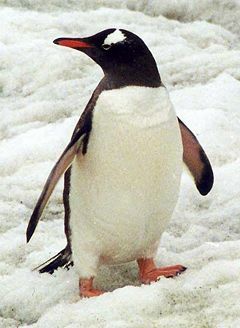 Pygoscelis contains species with a fairly simple black-and-white head pattern; their distribution is intermediate, centered on Antarctic coasts but extending somewhat northwards from there. In external morphology, these apparently still resemble the common ancestor of the Spheniscinae, as Aptenodytes' autapomorphies are in most cases fairly pronounced adaptations related to that genus' extreme habitat conditions. As the former genus, Pygoscelis seems to have diverged during the Bartonian, but the range expansion and radiation which led to the present-day diversity probably did not occur until much later; around the Burdigalian stage of the Early Miocene, roughly 20–15 mya (Baker et al. 2006). The genera Spheniscus and Eudyptula contain species with a mostly subantarctic distribution centered on South America; some, however, range quite far northwards. They all lack carotenoid coloration, and the former genus has a conspicuous banded head pattern; they are unique among living penguins by nesting in burrows. This group probably radiated eastwards with the Antarctic Circumpolar Current out of the ancestral range of modern penguins throughout the Chattian (Late Oligocene), starting approximately 28 mya (Baker et al. 2006). While the two genera separated during this time, the present-day diversity is the result of a Pliocene radiation, taking place some 4–2 mya (Baker et al. 2006). The Megadyptes–Eudyptes clade occurs at similar latitudes (though not as far north as the Galapagos Penguin), has its highest diversity in the New Zealand region, and represent a westward dispersal. They are characterized by hairy yellow ornamental head feathers; their bills are at least partly red. These two genera diverged apparently in the Middle Miocene (Langhian, roughly 15–14 mya), but again, the living species of Eudyptes appear the product of a later radiation, stretching from about the late Tortonian (Late Miocene, 8 mya) to the end of the Pliocene (Baker et al. 2006). The geographical and temporal pattern or spheniscine evolution corresponds closely to two episodes of global cooling documented in the paleoclimatic record (Baker et al. 2006). The emergence of the subantarctic lineage at the end of the Bartonian corresponds with the onset of the slow period of cooling that eventually led to the ice ages some 35 million years later. With habitat on the Antarctic coasts declining, by the Priabonian more hospitable conditions for most penguins existed in the subantarctic regions rather than in Antarctica itself. Notably, the cold Antarctic Circumpolar Current also started as a continuous circumpolar flow only around 30 mya, on the one hand forcing the Antarctic cooling, and on the other facilitating the eastward expansion of Spheniscus to South America and eventually beyond (Baker et al. 2006). Later, an interspersed period of slight warming was ended by the Middle Miocene Climate Transition, a sharp drop in global average temperature from 14–12 mya, and similar abrupt cooling events followed at 8 mya and 4 mya; by the end of the Tortonian, the Antarctic ice sheet was already much like today in volume and extent. The emergence of most of today's subantarctic penguin species appears almost certainly to have been caused by this sequence of Neogene climate shifts. What seems clear is that penguins belong to a clade of Neoaves (living birds except paleognaths and fowl) which comprises what is sometimes called "higher waterbirds" to distinguish them from the more ancient waterfowl. This group contains such birds as storks, rails, and the seabirds, with the possible exception of the Charadriiformes (Fain and Houde 2004). Inside this group, penguin relationships are far less clear. Depending on the analysis and dataset, a close relationship to Ciconiiformes (Slack et al. 2006) or to Procellariiformes (Baker et al. 2006) has been suggested. Some think the penguin-like plotopterids (usually considered relatives of anhingas and cormorants) may actually be a sister group of the penguins, and that penguins may have ultimately shared a common ancestor with the Pelecaniformes and consequently would have to be included in that order, or that the plotopterids were not as close to other pelecaniforms as generally assumed, which would necessitate splitting the traditional Pelecaniformes in three (Mayr 2005). The auk of the Northern Hemisphere is superficially similar to penguins: they are not related to the penguins at all, but considered by some to be a product of moderate convergent evolution (Tuinen et al. 2001). Acosta Hospitaleche, C. 2004. Los Pingüinos (Aves, Sphenisciformes) Fósiles de Patagonia. Sistemática, Biogeografía y Evolución. Doctoral thesis, Department of Natural Sciences and Museum, Universidad Nacional de La Plata. La Plata, Argentina. Retrieved January 7, 2009. Baker, A. J., S. L. Pereira, O. P. Haddrath, and K.-A. Edge. 2006. Multiple gene evidence for expansion of extant penguins out of Antarctica due to global cooling. Proc. R. Soc. B 273: 11-17. Retrieved January 7, 2009. Banks, J. C., A. D. Mitchell, J. R. Waas, and A. M. Paterson. 2002. An unexpected pattern of molecular divergence within the blue penguin (Eudyptula minor) complex. Notornis 49(1): 29–38. Retrieved January 7, 2009. Bertelli, S., and N. P. Giannini. 2005. A phylogeny of extant penguins (Aves: Sphenisciformes) combining morphology and mitochondrial sequences. Cladistics 21(3): 209–239. Clarke, J. A., E. B. Olivero, and P. Puerta. 2003. Description of the earliest fossil penguin from South America and first Paleogene vertebrate locality of Tierra Del Fuego, Argentina. American Museum Novitates 3423: 1-18. Retrieved January 7, 2009. Davis, L. S., and M. Renner. 1995. Penguins. London: T & A D Poyser. ISBN 0713665505. Fain, M. G., and P. Houde. 2004. Parallel radiations in the primary clades of birds. Evolution 58(11): 2558-2573. Retrieved January 7, 2009. Howard, L. 2003. Sphenisciformes. Animal Diversity Web. Retrieved January 07, 2009. Integrated Taxonomic Information System (ITIS). 1999. Sphenisciformes. ITIS Taxonomic Serial No. : 174442 . Retrieved January 7, 2009. Integrated Taxonomic Information System (ITIS). 2004. Ciconiiformes. ITIS Taxonomic Serial No. : 174770. Retrieved January 7, 2009. Jadwiszczak, P. 2006. Eocene penguins of Seymour Island, Antarctica: Taxonomy. Polish Polar Research 27(1): 3–62. Retrieved January 7, 2009. Jouventin, P., T. Aubin, and T. Lengagne. 1999. Finding a parent in a king penguin colony: The acoustic system of individual recognition. Animal Behaviour 57: 1175–1183. Ksepka, D. T., S. Bertelli, and N. Giannini. 2006. The phylogeny of the living and fossil Sphenisciformes (penguins). Cladistics 22(5): 412–441. Retrieved January 7, 2009. Marples, B. J. 1962. Observations on the history of penguins. Pages 408-416 in G.W. Leeper (ed. ), The Evolution of Living Organisms. Melbourne: Melbourne University Press. Mayr, G. 2005. Tertiary plotopterids (Aves, Plotopteridae) and a novel hypothesis on the phylogenetic relationships of penguins (Spheniscidae). Journal of Zoological Systematics and Evolutionary Research 43(1): 61-71. Retrieved January 7, 2009. Minard, A. 2007. Giant penguins once roamed Peru desert, fossils show. National Geographic News June 25, 2007. Retrieved January 7, 2009. Numata, M., L. Davis, and M. Renner. 2000. Prolonged foraging trips and egg desertion in little penguins (Eudyptula minor).] New Zealand Journal of Zoology 27: 291-298. Saint Louis Zoo. n.d. Humboldt penguin. Saint Louis Zoo. Retrieved January 7, 2009. Sivak, J., H. Howland, and P. McGill-Harelstad. 1987. Vision of the Humboldt penguin (Spheniscus humboldti) in air and water. Proceedings of the Royal Society of London. Series B, Biological Sciences 229(1257): 467-472. Slack, K. E., C. M. Jones, T. Ando, G. L. Harrison, et al. 2006. Early penguin fossils, plus mitochondrial genomes, calibrate avian evolution. Molecular Biology and Evolution 23(6): 1144-1155. Retrieved January 7, 2009. Van der Merwe, H. J. n.d. African penguins. Boulders Beach Lodge. Retrieved January 7, 2009. Van Tuinen, M., D. B. Butvill, J. A. W. Kirsch, and S. B. Hedges. 2001. Convergence and divergence in the evolution of aquatic birds. Proc. R. Soc. Lond. B 268:1345-1350. Retrieved January 7, 2009. Wever, E., P. Herman, J. Simmons, and D. Hertzler. 1969. Hearing in the blackfooted penguin, Spheniscus demersus, as represented by the cochlear potentials. PNAS 63(3): 676-680. Retrieved January 7, 2009. Williams, T. D. 1995. The Penguins: Spheniscidae. Oxford: Oxford University Press. ISBN 019854667X. This page was last modified on 3 February 2019, at 19:41.